There are only a few weeks left to reserve your spots at our exciting Artists for Appalachia annual meeting and 15th anniversary celebration! Join us June 21 in Charlottesville, Va., for an evening of music and readings with distinguished guests including Robert F. Kennedy, Jr., Kathy Mattea, Michael Johnathon, Daniel Martin Moore, The Honey Dewdrops, and more! Tickets / memberships are just $35 each, and reserved seating is available for an additional $15 donation. We hope you can join us on June 21 to celebrate the region we all love and to prepare for the next 15 years of protecting Central and Southern Appalachia! Our Appalachian Water Watch team has stepped up the pressure on coal industry violators of the Clean Water Act, launching a new lawsuit against a coal company for selenium pollution, this time in the Commonwealth of Virginia. And in Kentucky, the state Supreme Court upheld our right to intervene in the settlement negotiations between the state and the state’s biggest coal mining outfit, Frasure Creek. On June 2, the Appalachian Voices crew will join The Alliance for Appalachia and more than 150 citizens in Washington, D.C., for the 7th Annual End Mountaintop Removal Week in Washington. As part of the 4-day event, on Wednesday, June 6, we are asking the folks who cannot join us in D.C. to make their voices heard by contacting their Congressional representatives and asking them to end mountaintop removal coal mining and protect the health and well-being of Appalachian communities. 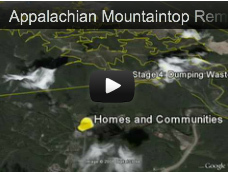 Appalachian Voices was recently featured in a Google Earth Outreach case study detailing our use of Google mapping tools to make a difference for the planet. Thanks to the technical expertise of our IT team, these tools have enabled millions of viewers to see mountaintop removal coal mining and the impacts it has on Appalachia. 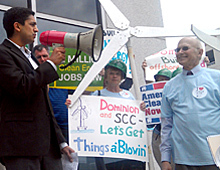 While the Southern Environmental Law Center represented us in front of the Virginia State Corporation Commission (SCC) during a hearing over how Dominion Virginia Power will meet electricity demand for the next 15 years, Appalachian Voices teamed up with the Sierra Club, Chesapeake Climate Action Network and about 50 passionate Virginians outside the building to rally for clean energy. 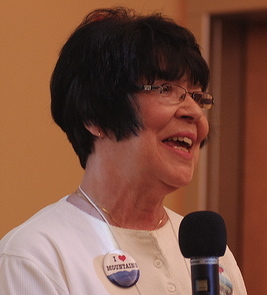 AV board member and Wise County, Va., resident Kathy Selvage recently traveled to Gainesville, Florida to talk about the devastation of mountaintop removal coal mining, and she discovered that people in the flatlands really do love mountains. Members Ann Kingston and her new husband, John, added a different spin to their bridal registry by including donations to Appalachian Voices as part of their gift options — collecting a total of $695 for the organization! We send our heartfelt thanks and congratulations to the happy couple, who helped save mountains and communities through their selfless act of love. Looking for an educational adventure for your kids this summer? Check out our environmental camps listings! May 28 -- Charleston, W. Va.
June 2012 -- Washington, D.C.
A walk from our capital, to the sources that provide its energy. A gathering to promote mountains, clean water and social justice. June 5, 7-11pm -- Frankfort, Ky.
June 7, noon-4pm and 7-11pm -- Pikeville, Ky.
June 21 -- Charlottesville, Va.
Help us celebrate our 15th anniversary! Aug. 24-26 -- Banner Elk, N.C.